Little did I think when I met Adrian almost two years ago that one day I would assume the role of patron (albeit briefly) and turn my house into a gallery to boot. But I have and for a very good reason. I believe his talent to be special and deserving of support. 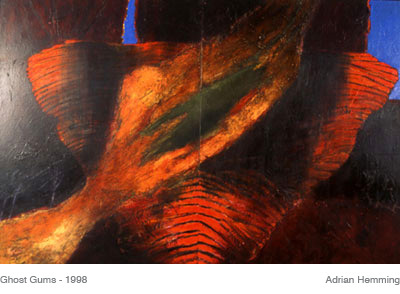 When I first encountered Adrian and his work at his studio on the Regents Canal, I suppose my knowledge and experience of ‘art’ was no more than average. The interest and appreciation was certainly there, though viewed through the more text-bound prism of a literary and theatrical background. The idea of becoming a ‘collector’ had never been a serious proposition. So what changed? That fateful viewing at Southgate Studios. I was immediately struck by the energy and directness of the work. I also liked the use of colour – bold, vivid, ‘unrealistic’ yet still managing to enhance the subject in just the right way. Above all, though, I admired what I’ve since come to realise is a Hemming trademark. He is, I feel, a ‘painter’s painter’, relishing the actual process of creativity in a very physical and sensual way. To borrow a sporting phrase, he’s not afraid to give either canvas or paper ‘some welly’. We subsequently became friends and it soon became clear that exotic places far away fired his imagination and, thereby, his art. At about this time I was planning my third trip to Australia (to see the Cricketing World Cup actually, though like this summer’s debacle, that’s another story) and I decided to commission Adrian to paint me ‘a big one’. We travelled a vast distance together, from the sophistication of Sydney to the red-brick provincialism of Melbourne (that’ll cause a ruck) and thence to the sticky frontier culture of Cairns in Northern Queensland and the magnificent rainforests beyond. Our adventures (and lodgings) were numerous, outweighed only by the quantity of ‘tinnies’ consumed. This probably explained my inability to articulate any artistic brief save for the rather odd parting shot: ‘And don’t forget to do me something hot and strange’. The result is ‘King’s Canyon’ and ‘Storm over Alice’. Both are hot, one arguably strange and I’m more than proud to be their owner – I succumbed, I’m afraid, when I saw the finished canvases and had to have them both. There are others too that I would love to have about me but one can only do so much. If this brief (and somewhat unusual) viewing serves to spread the word about Adrian Hemming it will have succeeded. And if anybody deserves the success, it’s him.